It is the age old question that DC Comics and Marvel Comics fans toss at each other like grenades... who would win in a fight, Hulk or Superman? Most people are quick to offer an answer, but if you really delve into both super heroes invulnerability powers and epic strength it becomes a much harder question to ponder. A few years back I posted a crazy CGI fan film that put the Green Monster vs the Kryptonian Madman, and it points out just how hard it is for either dude to win. But it is fun to see others opinions on the situation, and who better to weigh in on this than one of CCD's favorite comic artist, Invincible's Ryan Ottley. Ottley is a fantastic artist, and one of his latest posts to his Deviant Art page (click here to check his Deviant page, it is pretty amazing) tackles the subject in a way that I certainly didn't expect. 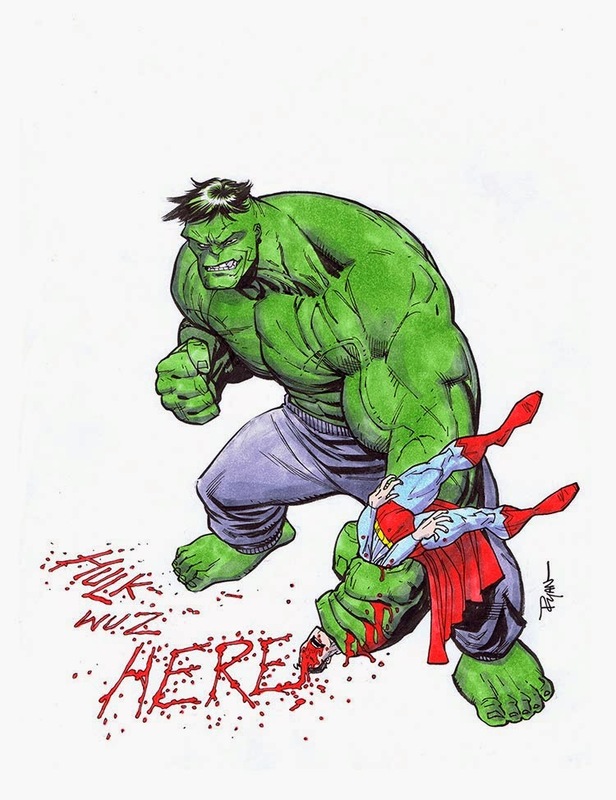 Do you think Ottley picked Hulk, or Supes? Here is a hint: It plays out the way I WOULD HOPE IT WOULD.... Check after the jump to find out for yourself. Ultimately, I would go with the Hulk as well. The simple reason is because Superman will stop, where the Hulk won't. An evil version of Superman would just fly Hulk into the sun, but Superman wouldn't it. That would be why he would lose. I also don't think Hulk would kill him, but he would beat him because Superman would keep giving him a chance. Superman, on his own, is more powerful than the Hulk though. Then again, Superman and Doomsday, who I think is comparable to the Hulk, beat each other to death. So who knows. Lol... that is a great response.